Bee & Fly Removal Services in Queens NY | Eliminate All Pest Control Inc. Bees, wasps, hornets and other stinging insects are dangerous and can even be deadly. Though most species of flies do not sting or bite, they can also be dangerous with their ability to quickly spread disease. Both of these insect varieties thrive in the spring and summertime. Eliminate All Pest Control Inc provides fly and bee removal services in Queens, NY in the spring and summer. Your fly or bee exterminator will take care of the bugs quickly and inform you of every step in the process so you can be sure your family is safe. Both flies and bees come out of hibernation during the springtime and buzz into action, rebuilding hives, mating, reproducing and making explosive populations. 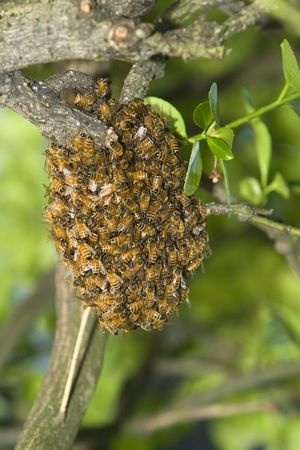 Different types of bees exhibit different types of hives, though almost all bee species are capable of painful stings. Some bees make large, round nests on trees or on roofs, others make paper or mud nests on the sides of houses, and others will burrow underground or can even burrow into houses. If a bee’s nest is disturbed, the worker bees will retaliate and many species of bees can sting multiple times, especially aggressive bees like yellow jackets and wasps. Common house flies do not build nests and instead feed on leftover food or rotting plant or animal material, where they lay their eggs. This makes flies a primary disease-carrying insect, as their life cycle depends on rotting matter, where countless bacteria also thrive. Schedule bee or fly removal in Queens, New York, today and stop numbers from multiplying.